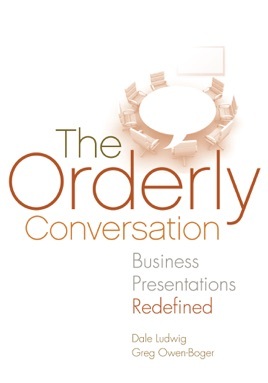 The Orderly Conversation is a groundbreaking resource for business presenters. For too long, business people have been taught to approach their presentations in the same way a speechmaker approaches a speech. But, business presentations are not a type of speech. They are a type of conversation. This book explores what this distinction means for you. It simplifies the process, eases your discomfort, and gives you a fresh way to think about the presentations you deliver. • what you’ve been taught about presenting doesn’t work for you. • the strategies you use to overcome nervousness aren’t working. • you find yourself breaking the "rules" of visual aids you’ve been taught. • you feel that preparing and delivering presentations ought to be a lot easier (and less time-consuming) than it is.